Unicorn. A legendary creature that is usually described to look like a horse with a horn on it’s head. Most of us have dreams about meeting this mythical creature, or sighting it once in our lifetime. Some say it is a myth, whilst others believe in it’s existence. This mythical creature is said to have existed since the earliest of times and although there is no proof of it actually existing, there are tons of statues, tapestries and scriptures portraying the mythical Unicorn. Up until today, there still exists a fascination of this creature which can be seen in movies, books, children’s toys and so much more. 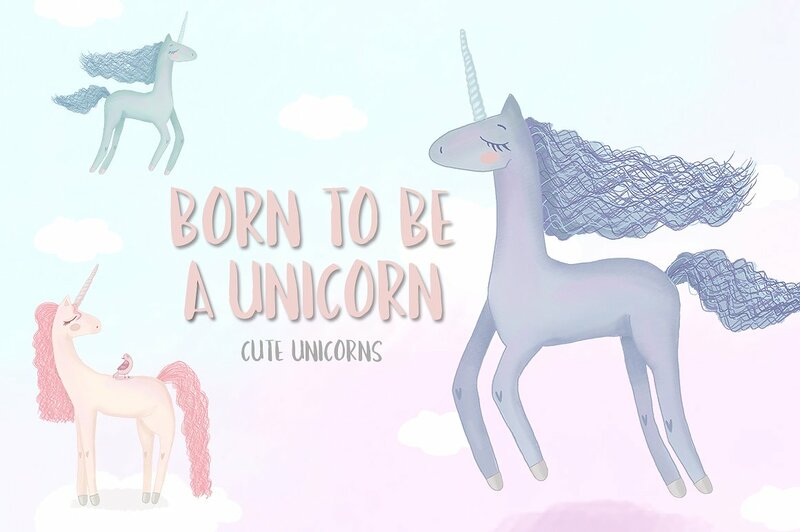 Even we have tons of unicorn graphics on our site! 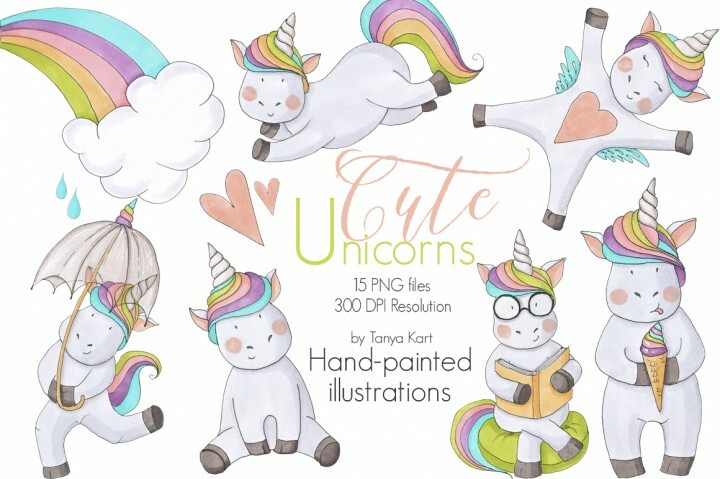 This little set of Cute Unicorns are hand painted by Tanya Kart. It comes with 15 individual graphic elements, as well as 12 seamless patterns. A whimsically fun, cartoon-ish set, which would look great on children t-shirts and party invitations, this is a steal for only $7! Another fun set but this time by elan creative co., this set has over 50 design elements that is inspired by fairy-tales and cartoons. The slightly odd shaped unicorn adds to the uniqueness and cuteness of the set. You can also find 3 bonus cards with unicorn quotes for your usage. A gorgeous blonde mane white unicorn set by Magic & Dreams. This dream-like set comes with 22 design elements in many formats, making it easier to use for all. It also includes five patterns, and 1 logotype. These pastel coloured long legged unicorns are by Natdzho. For only $4 you get 5 PNG files, and a AI/EPS10 vector file with all the elements included. 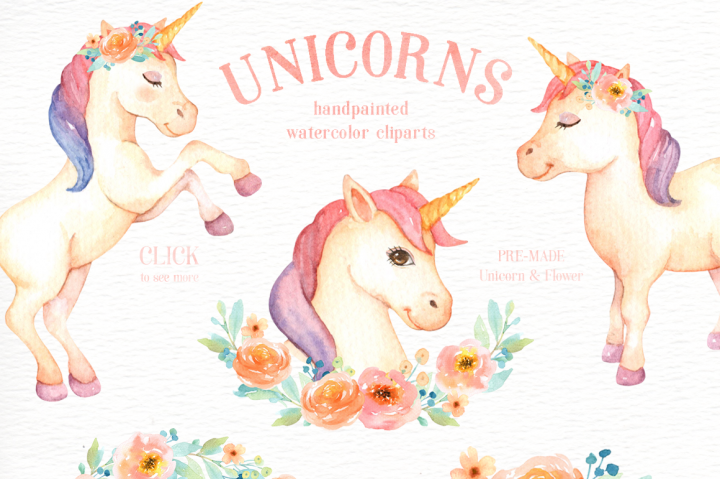 These unicorns will look amazing framed on the walls of your little girl’s bedroom, or even on the cover of your new journal. 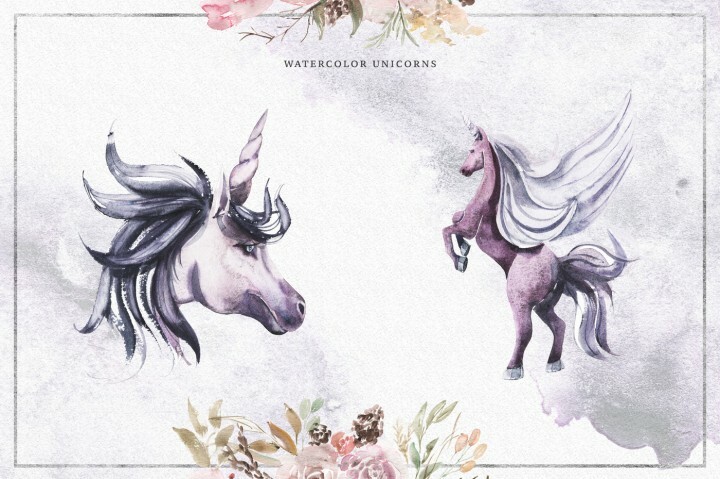 5August Art is the mastermind behind this fairy tale and magic inspired unicorn set. 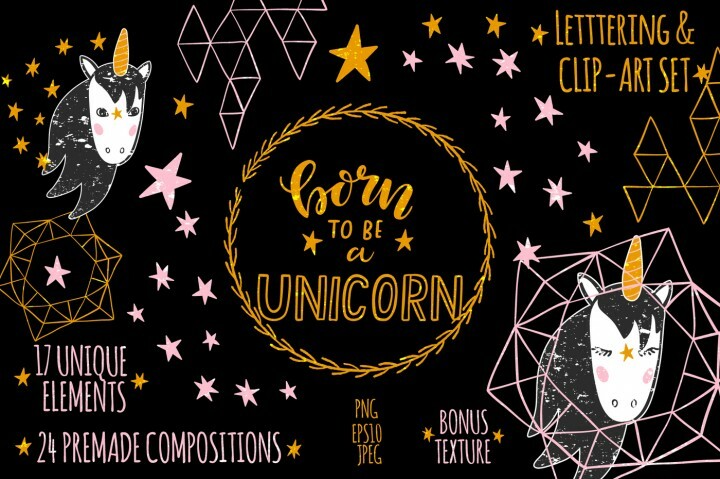 It includes high quality unicorn clip-arts, hand-lettering quotes, textures, patterns and pre-made compositions. Check out the preview images on how to use this set, from designing clothes to wallpapers, lots of cool things to create! A colorful set by Gluiki inspired by space travels, the unicorns in this set look otherworldly. 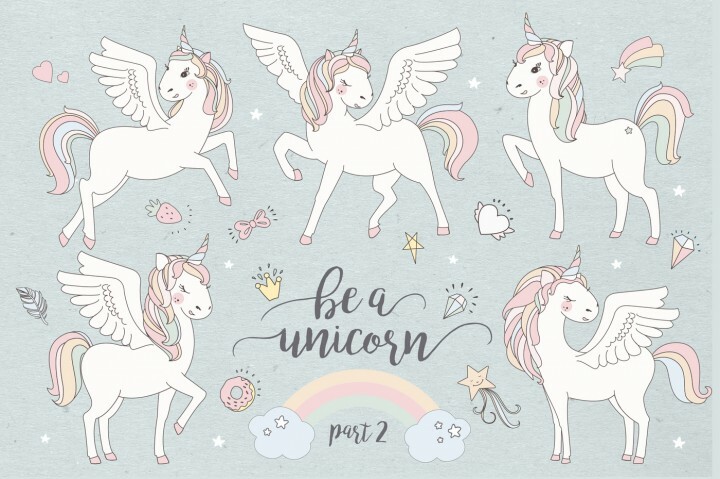 You can find 7 colorful unicorns and 3 seamless patterns in this set for just $3. This beautifully hand sketched set is by Anna’s Creations. The 42 vector design elements in this set include flowers, balloons, rainbows, clouds and of course 4 cute unicorns. 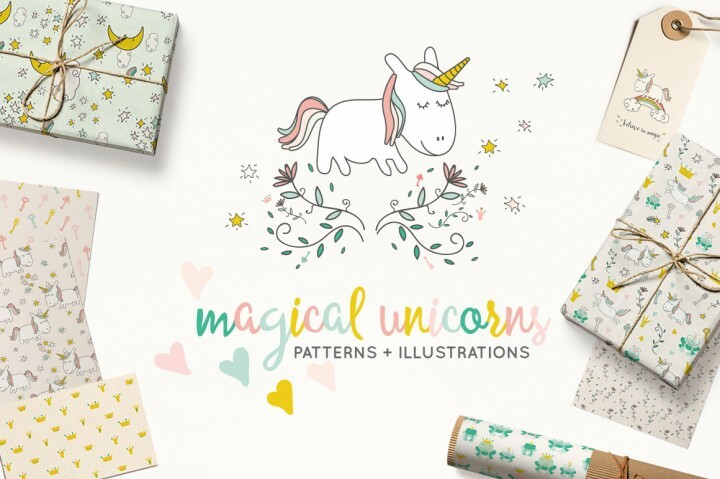 Besides that, you will find 2 seamless patterns and 4 pre-made unicorn posters inside this set. This is another unicorn design by Anna’s Creations. It carries a very different look for the unicorn, but still adorable. This set has over 130 items, which includes; pre-decorated unicorns, plain unicorns, decorative design elements, floral elements and so much more. You can find it in our Adorable Graphics Collection at a really good price, but it is only until this Friday, so hurry! An adorable unicorn set by everysunsun, that is hand painted with care. Just look at the pretty eyes on the unicorn! 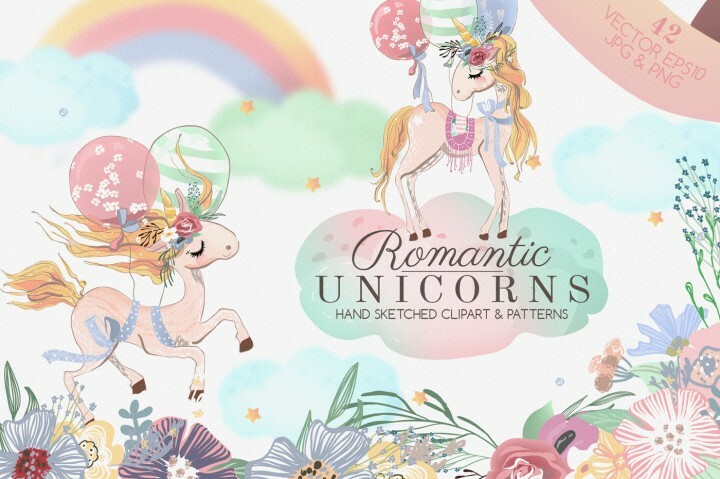 40 clip arts in total; floral elements, bouquets, 5 unicorns, wreaths and many more. Perfect for magical wedding invitations, greeting cards, quotes, posters, etc. Another cute pastel colored set, but this time the unicorns have wings! 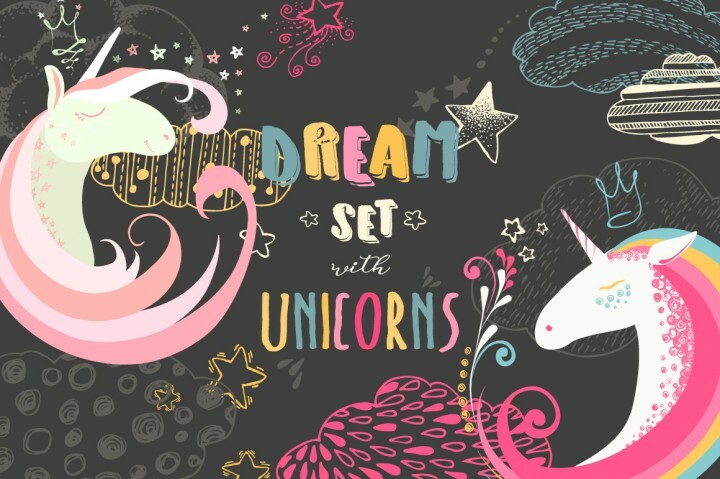 This set contains 7 unicorns, 30 individual elements, 7 quotes, 12 posters and 7 seamless patterns. Definitely a must have by Peace_Shop. This set by Spasibenko Art is extremely gorgeous. Although the set only contains 2 unicorns, we felt that this violet set should not be left out of this list. It contains 72 high quality PNG files, each hand painted. 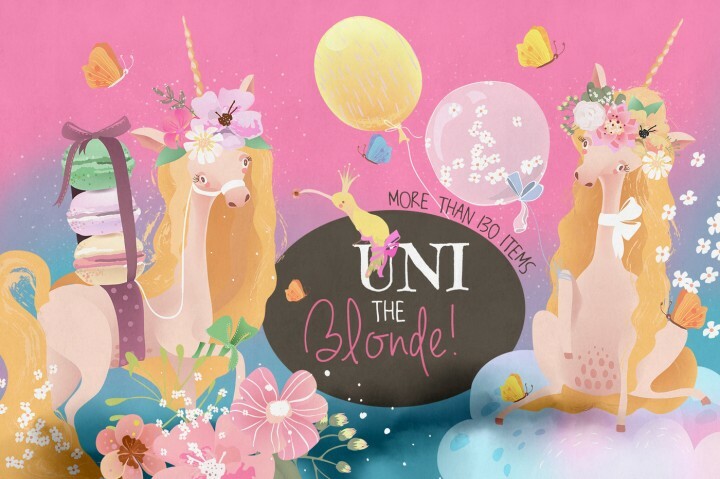 We hope you enjoyed this listicle of unicorn graphics on our site. 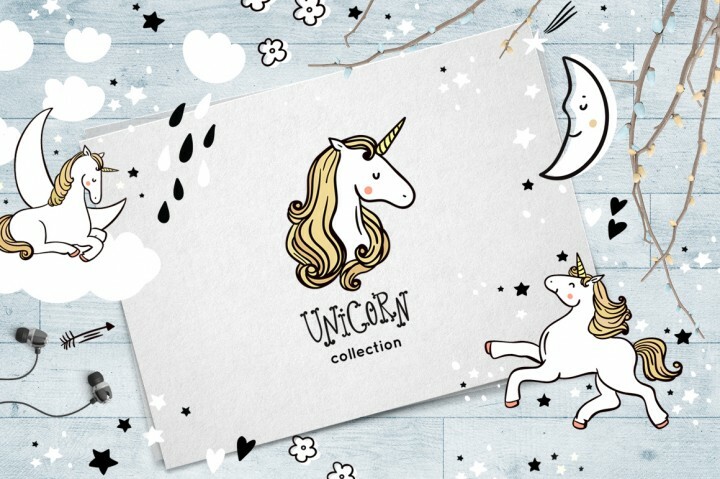 In fact, we have more unicorn themed products (SVG cut files, fonts, graphics) right here. If you love mythical creatures, do check out our post on Mermaid Graphics for more fun and inspiration!